Set amidst the impressive landscape of the Salzkammergut in Styria, this hotel offers a unique location on a plateau above Bad Aussee and beautiful panoramic views of the Dachstein. 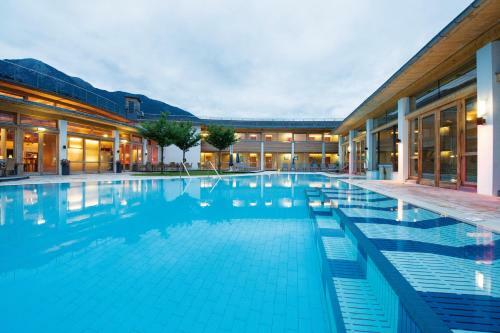 Lindner Hotel & Spa - Die Wasnerin is directly next to one of the most beautiful golf courses in the Alps. In winter the cross-country ski runs are only a few steps away. The pool and sauna area features an 80 m² indoor pool, a 160 m² outdoor pool (heated also in winter), several saunas and steam baths, massages, and a fitness room. Relaxation rooms, a tea house with a panoramic roof terrace, and an exclusive Private Spa are also available. All rooms at Lindner Hotel & Spa - Die Wasnerin have a balcony or terrace with views over the surrounding mountains. The restaurant has 4 traditional and welcoming theme bars, a winter garden, a lounge, and a garden terrace. A varied international cuisine, regional specialities, themed buffets and healthy meals await you. Half-board includes afternoon snacks and dinner with several courses and a choice of dishes, or a theme buffet. The bar with open fireplace, gallery and panoramic roof terrace serves a selection of fine Austrian wines, international drinks and cocktails, draught beer, and hot and cold snacks. Hotel Die Wasnerin?s history can be traced back to the 15th century. The listed historic part is now the heart of the hotel.